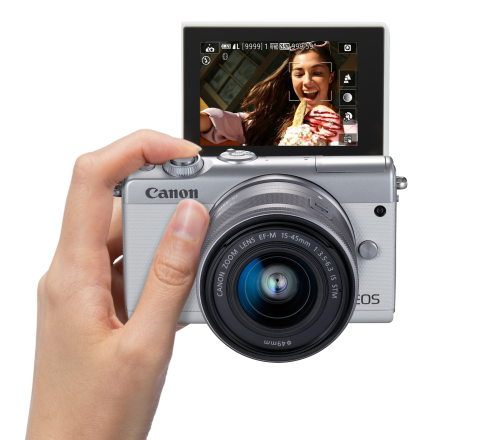 HONG KONG, 23 Mar 2018 - Canon today announces the launch of a new Pink EOS M100 digital camera with Self-Portrait mode, for every girl who wants to add a sweet touch to their photography. EOS M100 is well-received by the female market with its Smooth Skin Self-Portrait mode and a 180° Upwards Flip Touch LCD, providing intelligent Smooth Skin and Brightness functions for easy enjoyment of high-quality selfies. When the LCD monitor is tilted up 180°, a shortcut icon of Self-Portrait mode will be displayed automatically on the monitor for easy one-touch access. By adjusting brightness on a scale from 1 to 5, and setting Smooth Skin level on a scale of 5 from weak to strong, beautiful and natural selfies can be achieved effortlessly with Smooth Skin effect applies to the skin but not other details in the photo. With its high-speed “Dual Pixel CMOS AF” (DAF) and a DIGIC 7 Digital Image Processor, fast and accurate focusing is realized for easy enjoyment of maximized fun of selfie in high quality.